A stand of birches, lit by the morning sun. One tree is carved with a heart and the names of two people in love. 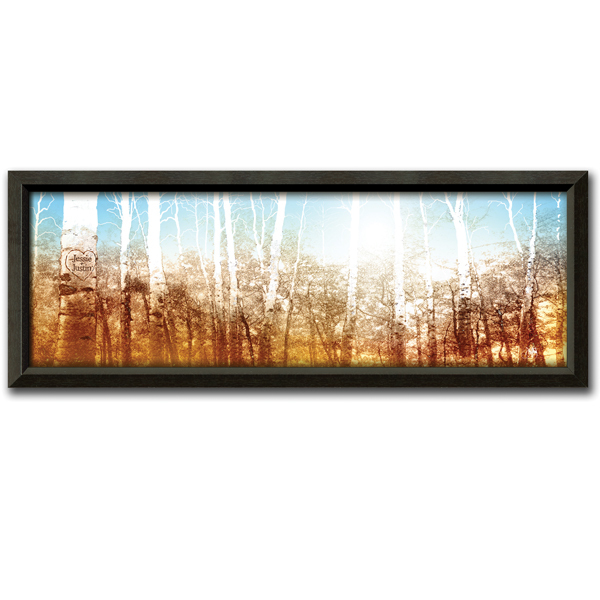 Artist Scott Kennedy's image is printed on fine-art canvas with a UVresistant coating, personalized with the names of your choice, and framed in wood with a dark espresso finish. Made in USA. Choose Small (9 1/2" x 19 1/2") or Large (13 1/2"w x 32 1/2"h). Specify name or initials (2 lines, up to 12 characters each). Allow 2 weeks. No rush delivery or gift box. Item can only be shipped within the Continental US.